The Jerusalem in Hebrews 12:22. God wanted to show New Jerusalem to John, so He sent an angel to him (21:9) to invite John to come. John responded, was in his human spirit, was carried away to a great and high mountain, and saw the holy city, Jerusalem. This seeing was at first a repeat of Revelation 21:2, but in this seeing (v. 10) the vision continued (v. 11-21) to show John much more about New Jerusalem. Here are the recent posts on 21:2 which correspond with the latter half of 21:10. 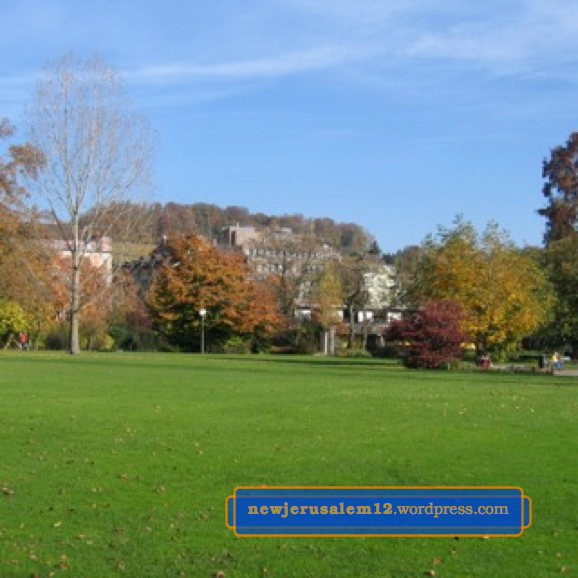 Thank the Lord for all the wonderful characteristics of New Jerusalem! 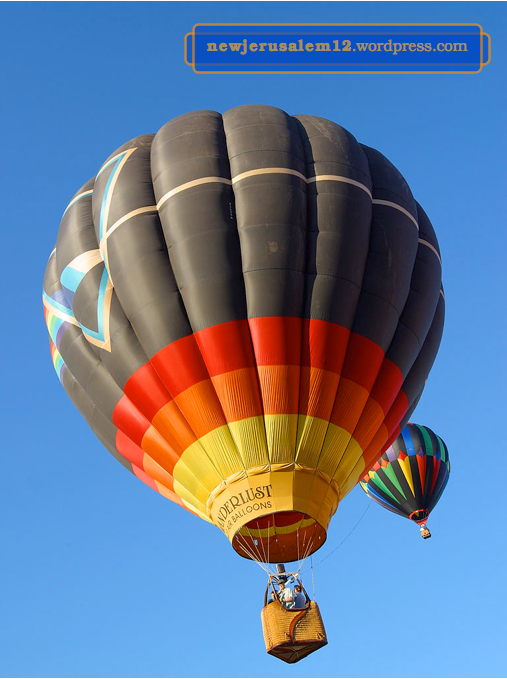 In Revelation 21:2 John tells us, “I saw the holy city, New Jerusalem, coming down out of heaven from God.” The fifth matter we consider in this verse is coming down out of heaven. 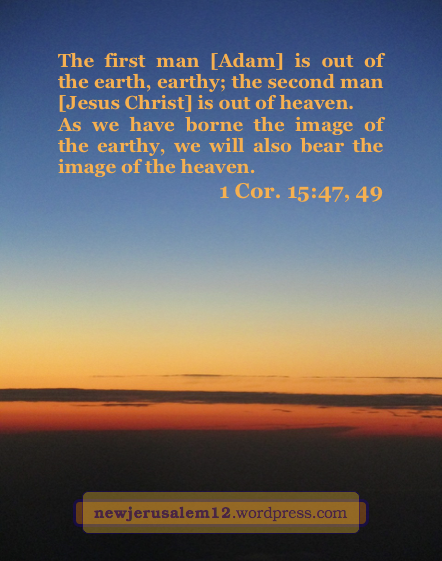 We were born into Adam but we have been reborn into Christ; hence we will bear the image of Him as the heavenly man, and corporately New Jerusalem as the heavenly city will bear the same image. New Jerusalem is in the new creation of Revelation 21:1. This creation consists of heaven and earth. New Jerusalem is heavenly in nature but it comes down out of heaven. It is no longer in heaven; its location is on the new earth. New Jerusalem on earth fulfills God’s goal in creating man—to have a corporate man on earth to express Him by being constituted with Him to bear His image. This is in progress now; “the new man, which is being renewed unto full knowledge according to the image of Him [Christ] who created him” (Col. 3:10). 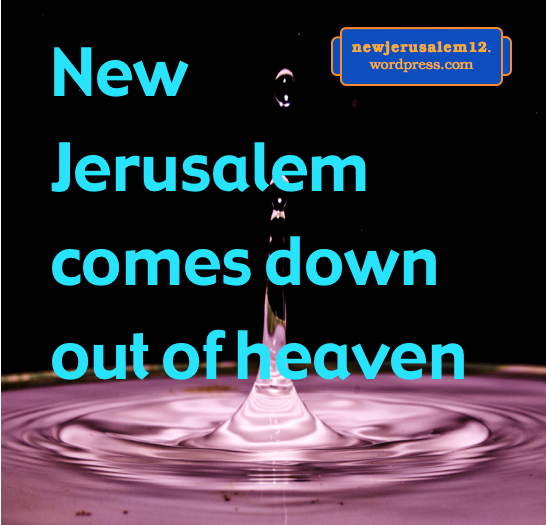 The consummation of this renewal is New Jerusalem bearing a heavenly image on earth. Hebrews 12:18-24 contrasts attributes of the Old and New Testaments. 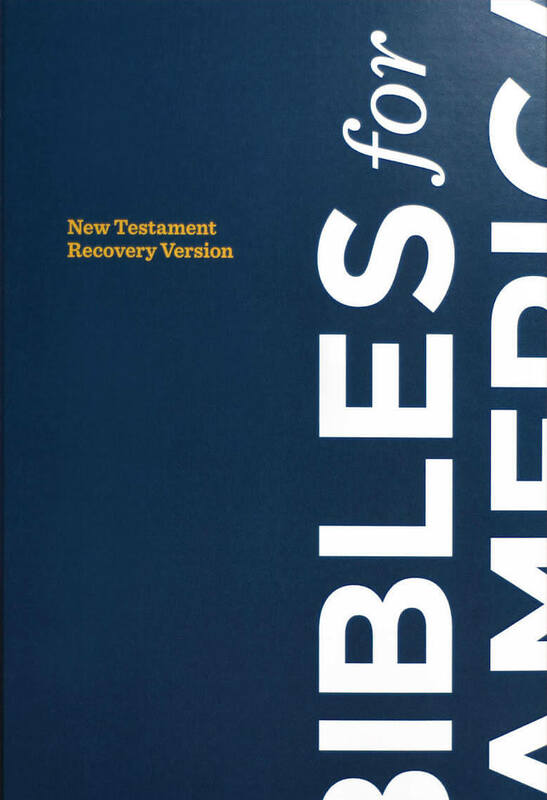 The Old Testament attributes are earthly but the New Testament attributes (both Heb. 12 and Eph. 2) are heavenly. The first ‘New’ attribute is that we “have come forward to Mount Zion and to the city of the living God, the heavenly Jerusalem.” The heavenly Jerusalem is firstly associated with a mountain, which also is heavenly in nature. Our being the light of the world is not derived from any earthly position; it is a consequence of being in Christ and living one with Him. In summary, the light, the city, and the mountain all come out of the divine life in God’s people. The Lord spoke all of Matthew 5, including verse 14, to His disciples, and three times spoke of “our Father” (v. 16, 45, 48). As sons of the heavenly Father we are the light of the world and the city on a mountain. All of this culminates in New Jerusalem. Photo by R. Robinson, courtesy of U.S. National Park Service. The previous posts are about the living temple, first Jesus alone (John 2) and then all His believers (1 Cor. 3:16, 2 Cor. 6:16), consummating in New Jerusalem. This living temple is the reality. But in the Old Testament, and lingering into New Testament times, there was a material, physical temple, a shadow, a figure, a portrait of the reality. Hebrews 10:1 says that the law has “a shadow of the good things to come.” The physical tabernacle came with the law in Exodus. But it was only a shadow, indicating that something “good” was to follow. Hebrews 8:5 says that the Old Testament priests “serve the example and shadow of the heavenly things.” “The good things to come”—in this case the living temple—is heavenly. Hence it is spiritual, not earthly and physicaL We are too accustomed to seeing and living among earthly things, but in God’s eyes only the heavenly, spiritual things are really “good.” This of course includes New Jerusalem, which is heavenly even though it comes down out of heaven from God. 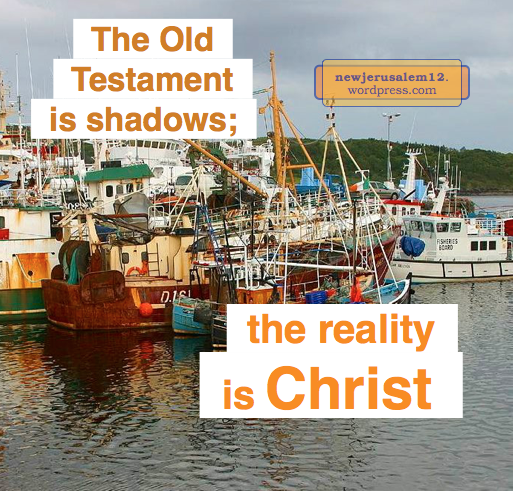 More specifically, Colossians 2:16-17, speaking about Old Testament things, says they “are a shadow of the things to come, but the body is of Christ.” The “body” which casts the shadow is Christ Himself. All the positive people, things, and activities in the Old Testament are shadows of Christ Himself or Christ enlarged in His Body, composed of all His believers. In light of Colossians 2, let us turn away from all the shadows, instead (2:19) “holding the Head” Christ, “out from whom all the Body, being richly supplied…grows with the growth of God.” His rich supply causes us to grow in Him and in His Body, growing unto New Jerusalem. Hebrews 11:16 tells us that the Old Testament people of faith, living on the physical earth, “long after a better country, that is, a heavenly one. Therefore God is not ashamed of them, to be called their God, for He has prepared a city for them.” We likewise live in an earthly environment but should have the same longing for a heavenly one. God’s response to our longing is that He has prepared a heavenly city. 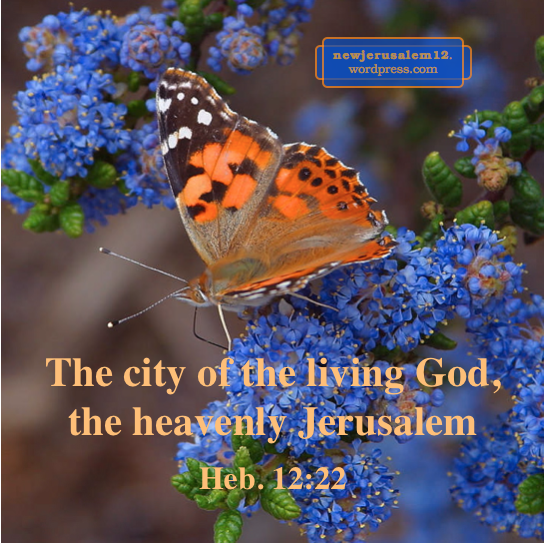 This is “the city of the living God, the heavenly Jerusalem” (Heb. 12:22). Although it is a heavenly city, John saw it “coming down out of heaven from God” (Rev. 21:2, 10). New Jerusalem is a heavenly city on earth. That “first tabernacle” stood during the first, the old, covenant. Now that Jesus Christ has come, died, and risen, the new covenant has been established and the way to the holy of holies is open. This New Testament holy of holies is the heavenly one, the New Jerusalem. The way to this heavenly holy of holies is open! Jesus Christ has opened the way for us! We cannot see the way physically but we can come forward in faith. Hebrews 10:22: “Let us come forward to the Holy of Holies with a true heart in full assurance of faith;” our foretaste of New Jerusalem. 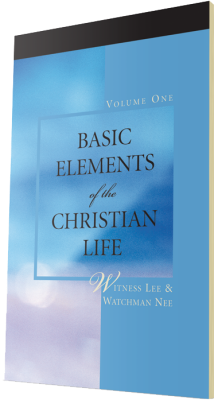 A hymn by Witness Lee begins, “Enter the veil and go without the camp, Taste heaven’s sweetness, thus the earth for-sake.” Then, “By heaven’s presence will the earth depart.” Further it encourages us to enter to “behold the glorious Christ” and “for resurrection pow’r.” This all is a foretaste of New Jerusalem. 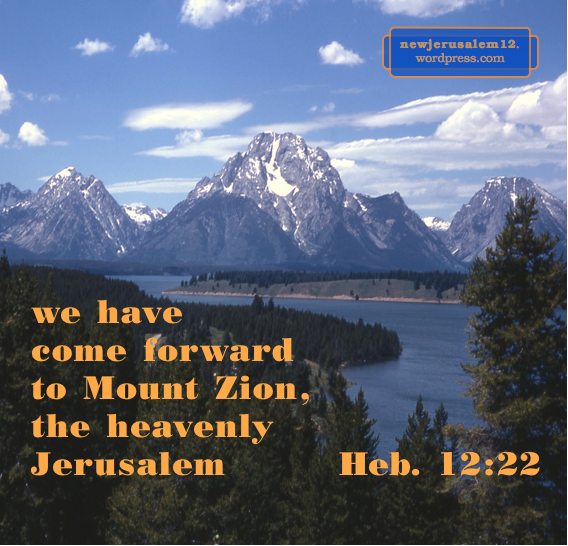 New Jerusalem is heavenly, as mentioned in Hebrews 12:22. 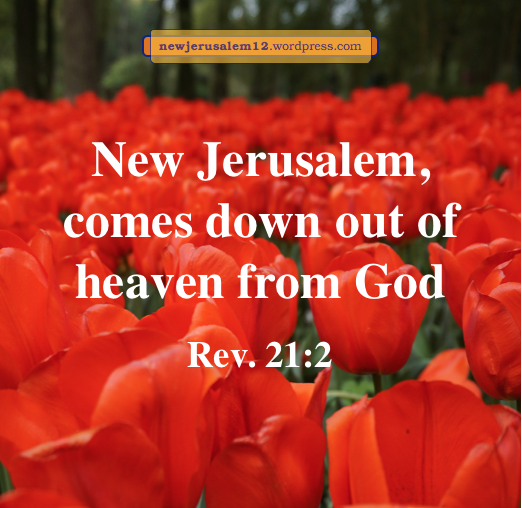 When New Jerusalem “comes down out of heaven” to the earth (Rev. 21:2), it changes position but retains its heavenly nature. When we enter the veil and behold the glorious Christ, we have a foretaste of heavenly Jerusalem. __If I His radiant face in heaven see, His footsteps I will follow here below. __If by the Holiest I am satisfied, How can I of earth’s vanities partake? In ourselves we cannot forsake the vanities but the heavenly satisfaction enables us. I encourage you to read or sing the whole hymn: words music. Lord, draw us to enter the veil that we may behold You, have heaven’s presence, and partake of resurrection power to forsake earthly vanities and walk with You every day. Lord, bring us into this foretaste of New Jerusalem. First Corinthians 15 says much about resurrection. 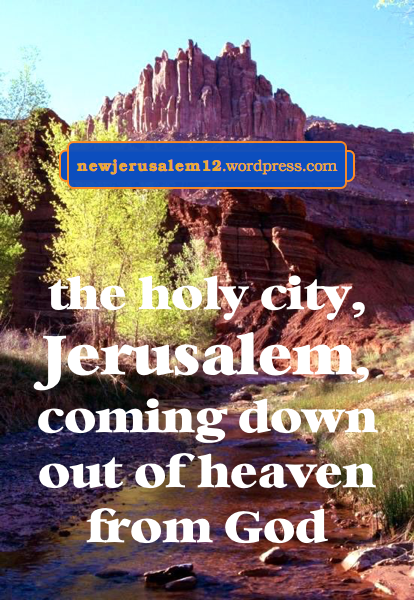 It also says something about New Jerusalem because New Jerusalem is a city in resurrection (see these posts ✤ ✤ ✤). First Corinthians 15:35-44 speaks about death and resurrection. Verse 44 concludes, “It is sown a soulish body, it is raised a spiritual body.” We will be raised not with the same body we have now but with a spiritual body. Verse 47 says, “The first man [Adam] is out of the earth, earthy; the second man [Jesus Christ] is out of heaven.” Verse 48 continues “As the earthy is, such are they also that are earthy; and as the heavenly is, such are they also that are heavenly.” In Christ we are the heavenly people, no longer the earthly. Verse 49 says, “as we have borne the image of the earthy, we will also bear the image of the heavenly.” In resurrection we no longer bear the image of created and fallen Adam but rather the image of the resurrected Jesus Christ. This is the image of New Jerusalem. In resurrection, with a spiritual body, being a heavenly people, and bearing a heavenly image, we correspond with a heavenly, spiritual city, not with an earthly, physical city (related posts ◉ ◉ ◉). This city is heavenly in nature but located on the new earth (Rev. 21:1-2). As resurrected, spiritual, heavenly people, we should not expect New Jerusalem according to our soulish, natural, earthly desires. Rather, Christ is the center and content of this city. He will be our life supply, our joy, our peace, our rest, our everything. We can enjoy Jesus Christ in resurrection every day to enter a foretaste of New Jerusalem. We are in a series of excerpts from an issue of Affirmation & Critique* about New Jerusalem. The prior post is on New Jerusalem as a sign of the consummation of the operation of grace as allegorized in Galatians and Hebrews. Both Galatians and Hebrews are focused on bringing believers back to God’s operation of grace so that they can be built up into God’s corporate expression, which is allegorized as the Jerusalem above in Galatians [4:26] and the heavenly Jerusalem in Hebrews [12:22]. Galatians, Hebrews, and Revelation point to an allegorized city of grace—the Jerusalem above, the heavenly Jerusalem, and the New Jerusalem [Rev. 21:2, 9-11]. Each of these books concludes with the most fitting interpretation of this allegory: “The grace of our Lord Jesus Christ be with your spirit, brothers. Amen” (Gal. 6:18), “Grace be with you all. Amen” (Heb. 13:25), and “The grace of the Lord Jesus be with all the saints. Amen” (Rev. 22:21). Lord, grant me to find and hold grace today and never to fall away from it. Lord, grace me all the way to New Jerusalem. God has prepared a city for His people (Hebrews 11:16), who are people of faith (the subject of Hebrews 11). This city is New Jerusalem. And, by faith we “have come forward to…the city of the living God, the heavenly Jerusalem” (Hebrews 12:22). God has prepared New Jerusalem. We do not see the city with our eyes but “faith is the substantiation of things hoped for, the conviction of things not seen” (Hebrews 11:1). We have faith because God has allotted it to us. In 2 Peter 1:1 many English translations say that we have received/obtained like precious faith. It does not originate in us; God allotted faith to us and we received it from God. Other verses speak of our faith and indicate that we do need to exercise faith. True! But we must remember that “our faith” does not originate with us. By this faith we give attention to the unseen, eternal things. 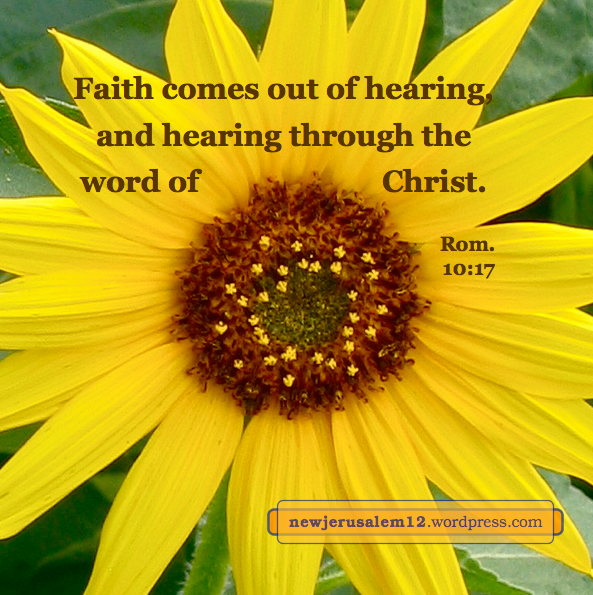 By faith come forward to and substantiate New Jerusalem. God has prepared New Jerusalem for all the people of faith (Hebrews 11:16). Spiritually, we have come forward to this heavenly city (Hebrews 12:22). However, God must do a work in us before we can fully enter into this marvelous city. God’s work in us, after our initial salvation, includes growing (1 Corin-thians 3:6), renewing (Ephesians 4:23), sanctifying (Hebrews 2:11), transforming (2 Corinthians 3:18), and building (Ephesians 2:21-22). God desires to work in us and we need to cooperate with Him. By cooperating, we enter into what He has prepared, including New Jerusalem. Acts 14:22 tells us that “through many tribulations we must enter into the kingdom of God.” God arranges whichever tribulations are necessary. His intention is not our suffering but our entering. Likewise, 1 Peter 1:3-9 tells us that we have been regenerated unto a living hope, unto an inheritance kept in the heavens and unto a salvation ready to be revealed at the last time. These verses also say that we might be sorrowful under trials but that these are for the proving of our faith. And, Hebrews 9:15 assures us that we will receive the promise of the eternal inheritance. Similarly, 2 Corinthians 4:17 says, “our momentary lightness of affliction works out for us, more and more surpassingly, an eternal weight of glory.” Verse 18 then encourages us not to focus on the temporary, visible things but on the eternal, invisible things. Let us go on by faith, not dragged down by the environment, keeping our spiritual eyes on the eternal glory of New Jerusalem. God has already prepared a city for His people (Hebrews 11:16). This is New Jerusalem. At present we can have a spiritual foretaste of New Jerusalem but we do not have a full realization of it. The foretaste combined with the lack of full realization should motivate us to rise up and pursue. “We are not of those who shrink back” (Hebrews 10:39). Rather, as Paul said, “I pursue, if even I may lay hold of that for which I also have been laid hold of by Christ Jesus” (Philippians 3:12). What then should we pursue? Jesus Christ!! Paul’s pursuing in Philippians 3:12 is defined in prior verses: “that I may gain Christ” (v. 8) and “to know Him” (v. 10). ____Press on, press on to Christ! May the words of this song be our attitude, our aspiration. The fuller our realization of Jesus Christ, the more we will taste the reality of New Jerusalem. Let us be encouraged by the Lord’s word in Philippians and by its expression in this song. ____Press onward with this mind! Let us pursue, let us press on, to the fullest gaining and knowing of Jesus Christ. This is our path to New Jerusalem.